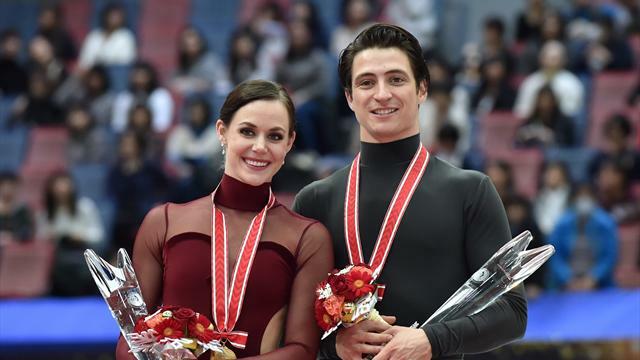 A confident Tessa Virtue and Scott Moir spun to ice dance gold in Japan's grand prix event on Sunday for their second podium-topping finish, clinching a place in next month's final. Skating to a medley of songs from 'Moulin Rouge', the two-time Olympians performed a routine by turns dramatic and lyrical for their second gold medal after Skate Canada two weeks ago in what they said was an important step on their way to the Pyeongchang Olympics in February. "We've made some improvements this week that we're quite proud of from Skate Canada," Moir said.
" "We only had one week. We're looking to make the same sort of transition into the final. It's a great stepping stone here for us."" The veteran pair, who has skated together for two decades and were the only ice dancers to take gold in an Olympic debut when they won in Vancouver in 2010, racked up 117.72 points for a total of 198.64. Madison Hubbell and Zachary Donohue of the United States took the silver medal while 2014 World Champions Anna Cappellini and Luca Lanotte finished third. With four out of six grand prix events over, Virtue and Moir are certain of a place at the December final in Nagoya, Japan, but the other two pairs still have to wait.